HENOKO, Okinawa, Japan — The heated playoff competition currently taking place on basketball courts of the NBA and hockey rinks of the NHL have taken a back seat to the local annual sports tradition between Henoko residents and Marines stationed aboard Camp Schwab. 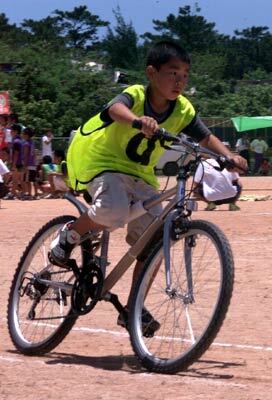 More than 500 people attended the 31st annual Henoko Sports Day at the Henoko athletic field May 16. 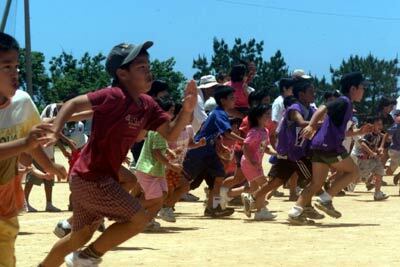 Members of all the residential districts of Henoko, to include the 11th district Camp Schwab, gathered for a day of friendly athletic rivalries. The event started at 9 a.m. with the opening ceremony where athletes, flags and torches were brought out in front of the viewing stands. After opening remarks from Henoko district mayor Yasumasa Oshiro, the athletes began their warm-up exercises in preparation for the upcoming events. The morning consisted of an 80 and 50-meter dash, obstacle relay, 400-meter women’s relay, centipede race, 400-meter family relay, 1600-meter bicycle relay, and the men’s 800-meter relay. After dusting off the dirt from their clothes, the Henoko Women’s Association participated in traditional folk dances before breaking for afternoon intermission. A few venturous Marines from Camp Schwab joined the Henoko dancers during the performance. The afternoon events began with a free candy giveaway to kids six years old and younger. 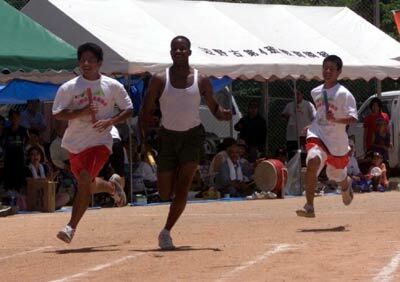 The competitive events started soon after with the Multiple Relay. A three-way tug-of-war commenced after the multiple relay, which was then followed by the bike rim-balancing relay, husband and wife 400-meter relay, beverage chugging 10-meter dash, women’s 700-meter relay, and the men’s 700-meter relay. The events came to a close at 4 p.m. that afternoon. With neighbors shaking hands and congratulating each other on a job well done, the Marines of Camp Schwab and residents of Henoko parted ways knowing they had renewed their friendships again through competition and fun.